After fitting another UEC, the non start issue where the fuel pump was not getting a 12v feed appeared to have been solved. Certainly for around 4 months, until it reared its ugly head again. With a direct feed to the pump, the pump ran so again no issue there with the fuel pump itself. So the next thing was to remove the UEC and take a look. Upon inspection, X2 pin 56 in the UEC (fuel pump feed) was showing signs of corrosion which was not there previously. Swapping the UEC to another car proved that the UEC was not at fault and was working fine, which then suggested an issue within the wiring somewhere. Luckily Vauxhall/Opel factory wiring diagrams make it easy to identify what goes where within the UEC and associated plugs. Upon further investigation plug X2, pin 56 in the loom had clearly had a meltdown, which again was not evident before. 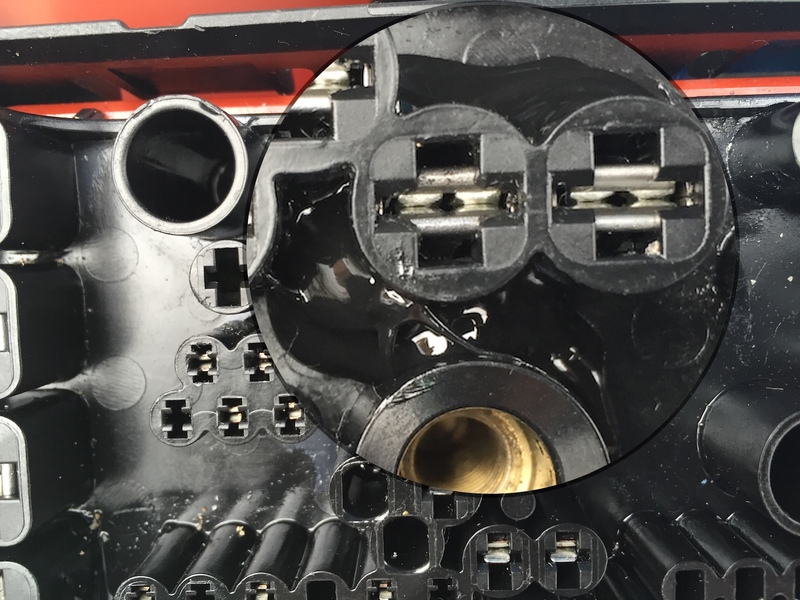 Carefully removing plug X2 from the housing revealed the extent of the damage within and underneath the plug. At least the intermittent cause had now been found!! Next the housing which holds the 3 plugs in place to allow the UEC to locate correctly into them was removed to give more working space. A new terminal was sourced and removed from an old loom from the same X2 plug, keeping the correct wiring colour of red/blue trace. Terminal arroved red, removed from plug X2 arrowed blue. Plug X2 once it had been cleaned up, had clearly burnt out over a period of time and had left some visible damage to the plug itself. Trial fitting the new terminal it became clear that the damage to the plug meant the terminal would not locate and stay in place. So with the new terminal fitted into the plug on the car and the damage to the plastic was repaired with Innotec, ensuring the pin remained secure in the plug (left hand terminal). The new wire was fed through into the existing loom and stripped ready for soldering. The UEC housing was then refitted, the looms relocated having been rebound with electrical tape and new loom tape as required and secured back into the plugs with a cable tie and the UEC refitted. Once the battery was reconnected everything was back up and running off the key, with no additional fuel pump feed.